Ridgewood condo consists of high rise apartments and low rise townhouses and are built in 1977 to 1981. This condo is situated off Holland Road, Ulu Pandan Road and is within 3 minutes drive to Holland Village and a short drive to the Orchard Road. The estate is self-contained with retail shops. The apartments are appealing to the expats if they are renovated as they have large balconies, big in size and rectangular in layout. The townhouses is located at the side roads which their private entrance. Rented an unit (blk3, #04-02). The unit has 24/7 environmental noise issue. The noise was strongly evident in the master bedroom (55db to 60db). The noise (thumping and humming) effect and transmitted vibrations were especially heard and felt at night, when the windows were shut and curtains drawn. NEA has assisted with some investigations and their readings were 45db to 50db. According to the landlord, as the noise nuisance being an environmental noise, it was beyond his control and early termination of tenancy agreement could not be provisioned even though the environmental noise was not stated in the tenancy agreement and was not mentioned by his agent. I advise anyone who would like to view the unit to bring along a sound level meter as kindly advised by the landlord since everybody has different noise tolerance level. As for me and as recommended by the World Health Organisation, 30db to 40db is healthy. Rented a condo on a low floor (not a corner unit) and cannot wait until my lease is up. Plumbing is a huge issue. Every time my upstairs neighbor or my next door neighbor flushes the toilet, turns on the tap or takes a shower, I hear it from the master bedroom. And it sounds like it is coming from my own unit. It is that loud. To make matters worse, my unit faces Mount Sinai Drive, and the buses and delivery trucks start plying the road at around 6:00 am if not earlier. If I'm not up by then, I am woken up by the noise. Finally, the condo's hallway lights shine in to bedrooms 2 and 3. If you don't have blackout curtains, you better get them. Otherwise, it's as if you're sleeping under a street lamp. I don't recommend this condo for rental. Condo is OLD. Thus units for rental, unless newly renovated, are typically OLD with things breaking down frequently. Besides the costs for minor repairs that have to be borne by tenants (renting such OLD units as are generally provided for in the tenancy agreement), the real cost to the tenants is the time cost to wait for repairmen to fix bits and pieces of the apartment every now and then. Grounds may be spacious but the internal structure of the apartments are poorly designed as one could hear neighbours' showers being turned on, toilets being flushed and cats treading on the floor. Not recommended for light sleepers or tenants who are usually not at home during the daytime as repair is often done during the daytime. 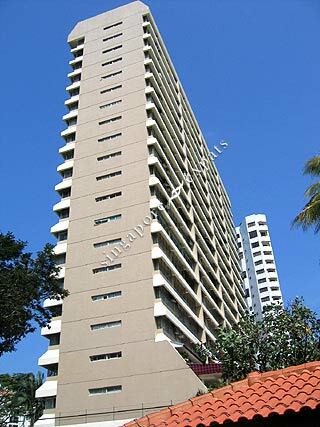 Rental market now in July 2015 means that there are a lot of options for tenants who wish live closer to Orchard Rd or CBD area. The condo occupies spacious grounds, sited on an elevated plot in the prestigious and exclusive Mt Sinai neighbourhood. Units at some blocks offer a fantastic view of the city and nature reserves to the north. Internal design, while a little aged (after all the condo was built in the late 70s), are generous in space and well proportioned - something that you can no longer find in Singapore. There are many recreational facilities and shops such as grocery stores, cafes, restaurant, clinic etc. The neighbourhood is exclusive and quiet, yet very near to Holland Village and the city. Ridgewood is very suitable for expat or local families. Newly renovated, cosy, warm, clean, comfortable, windy, relaxing, spacious with Pool and city view. Condo was built with a Hawaiian theme. Great for: Families and working professionals would enjoy this unit and the condo facilities. Amenities: newly renovated gym/fitness corner, bath/ changing room, swimming pool, sauna, BBQ pits, basketball court, squash court, tennis courts, club house with several dining options (Thai, Chinese, western ), mini-mart, meat deli, playground, covered car park, 24 hours security. Near to Jelita cold storage and Holland Village, Orchard Rd. Close to eateries and restaurants located at Holland Village. Residents can head down to the nearby shopping malls like Star Vista at Buona Vista, Clementi Mall for amenities such as supermarkets, restaurants, banks, and more. In addition, it is also close to the Singapore Science Center, Clementi Mall and shopping malls (Gems, J gateway, Cube, IMM) at Jurong East. Nearby overseas schools: Nexus International School, United World College of South East Asia (UWCSEA), Canadian International School (SG). Driving from Ridgewood Condo to either the business hub or the vibrant Orchard Road shopping district takes 10 - 15 minutes, via Mount Sinai road respectively.